Bob Dylan nails what we are experiencing in the energy industry today with the title of his classic ballad, The Times They Are A’Changin’. In that song, he notes “The slow one now will later be fast, as the present now will later be past.” He may as well be singing to evaluators of energy efficiency programs, since evaluators have a lot of experience looking back at the past to explain the present – and also using that information to inform future plans, by the way. But times are changing – a lot, and fast – in our industry, in the Northeast, and around the country. While energy efficiency is helping to drive consumption down and smart technologies and distributed energy resources (DER) like demand response, storage, renewables, are growing, it’s not your parents’ energy services landscape anymore. What information does our industry need in order to measure and track – more or other than what is available now? What do regulators and companies need to know to design programs, integrate efficiency with other resources, and implement the policies that keep ratepayers, bottom lines and system operators copacetic? The whole industry grapples with these questions, and evaluators are called on to help answer them. 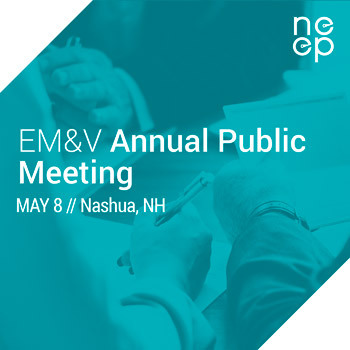 Addressing changing times is why NEEP is focused on the future for its coming EM&V Annual Public Meeting on May 8 in Nashua, N.H. There will also be an open networking invitation the evening before. The meeting brings regulators, consumer advocates, program administrators, and private and non-profit stakeholders together. Think of it as a regional medley on the theme of the value of energy efficiency - an avoided cost study, DER approaches drawn from non-wires experience, NY storage research, Rhode Island demand reduction as power sector transformation, and popular themes from cost-effectiveness mixed with a modern interpretation (i.e. two panel discussions) on where control technologies and Technical Reference Manuals can take us. NEEP greatly appreciates participation from the meeting’s host state of New Hampshire with perspectives from regulators (Les Stachow), consumer advocates (Don Kreis), and program administrators (Miles Ingram, Eversource). E4TheFuture is a co-sponsor. Last but absolutely not least, we are pleased to announce that the Association of Energy Service Professionals (AESP) Northeast Chapter has joined forces as a co-sponsor of this event and to help promote industry-wide networking and professional development for the region. Don’t think twice - Register now for the May 8 Annual Public Meeting.